green box indicates credit term which is 30 days. red box shows those invoices that exceeded credit term. yellow box indicates Inv1164 dose not exceed credit term (30 days). How to view sales return details? In order to view CM with sales return GL code users need to select CM (e.g.CM1026). Negative figures in this report show deduction from invoices regarding to sales return or sales discount and deposit. 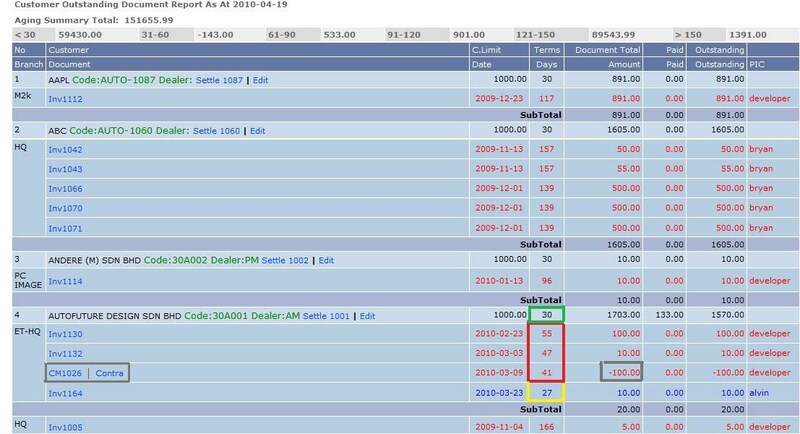 This list shows all or selected credit memos issued by the company user to customers regarding to sales return, sales discount,and wrong product.